In mid September the Microsoft Innovative Teachers from around Australia gathered at the ACEL Conference in Sydney. It was here that we learnt our fate and discovered that we were required to make and present a poster at the 7th Asia Pacific Regional Innovative Education Forum to be held in Phuket Thailand in March 2011. According to the official documentation posters will be judged on the objectives and outcomes of the lessons, learning tables and activities, instructional strategies, relevance of ICT tools, innovative use of ICT tools and teachers as a change agent. 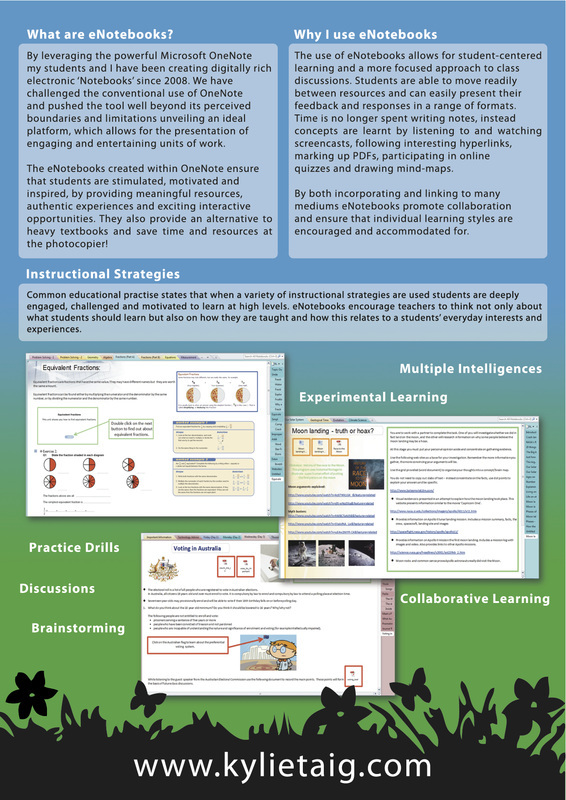 Since learning about the poster requirements almost five months ago, I have spent many hours working on my project: "eNotebooks - Cultivating Diverse Learning Resources". While it has been a long and stressful process, I am extremely happy with the outcome! 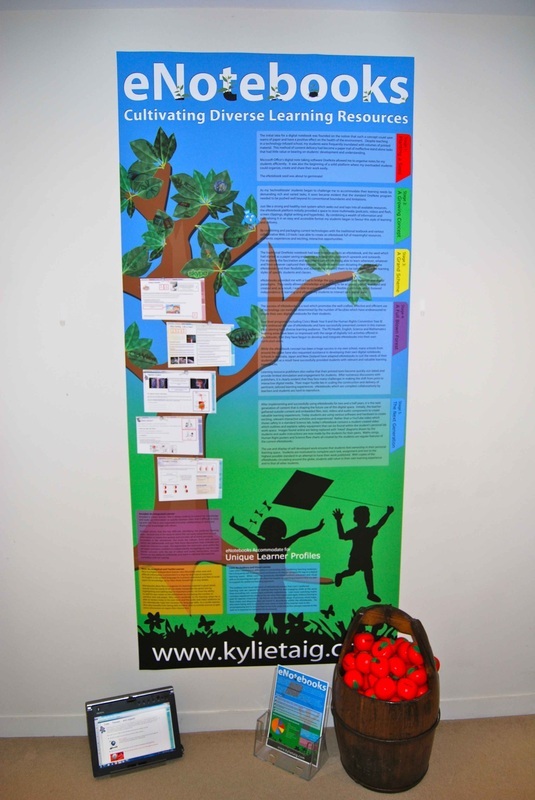 The theme of my poster centres around the growth and development of a tree. For me eNotebooks started as a small seed, a simple idea which soon blossomed into a ‘full blown forest’. 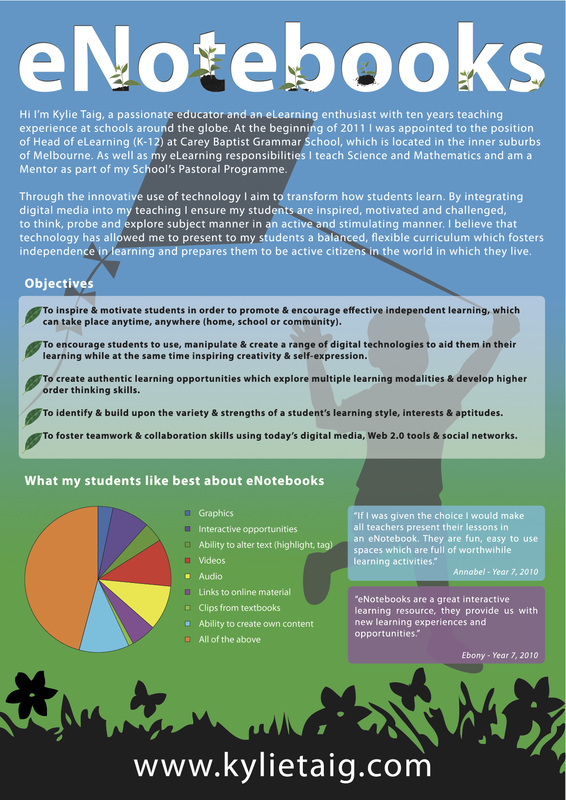 eNotebooks allow for differentiated learning and just like a tree they branch out and encourage and promote interest and enthusiasm in teaching and learning. I would like to sincerely thank all those who have read countless drafts, been colour consultants and become visual experts. I am very excited to have made it to this point!! I also owe my deepest love and gratitude to Matt who has been an integral part of all stages of the poster, brochure and business card developments – this all would not have been possible without you!! On to Thailand and beyond!